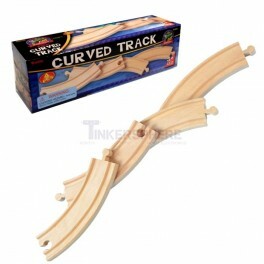 Wooden Curved Train Tracks for your wooden train sets. Compatible with Thomas Wooden Railway, Brio, Melissa & Doug, BigJigs, Chuggington, Ikea and other major manufactures of wooden train systems. 4 pieces of Curved Wooden Train Tracks for your wooden train sets. Compatible with Thomas Wooden Railway, Brio, Melissa & Doug, BigJigs, Chuggington, Ikea and other major manufactures of wooden train systems.